In the early days of my nerdom, I used to stay up late before the book fairs my elementary school held, marking and then erasing, and then marking again which books I wanted to buy when the fair opened. Our teachers provided us beforehand with a catalogue of the books that would be at the fair, but my mother capped how much I could spend. It meant budgeting. I hated not being able to buy whatever I wanted, but the limitations made me appreciate all the more what my restricted dollars bought and what they could not. I would wander the stacks of books, learning titles I hadn’t known existed, and I would be grateful for my exposure to them; later I would look in the library for those I hadn’t been able to buy. Attending art fairs offers the same experience. Not the art-buying part. (I’m a writer; all my dollars are restricted.) I mean the exposure to art and artists represented by far-flung galleries. Last week’s art fairs offer the opportunity to encounter artists who haven’t yet made into a museum or other institution that confers the status and cash most artists dream of. There’s something delicious about wandering the paths of an art fair and wondering which of the artists, if any, will be catapulted to household fame why. That’s the experience I had when I encountered the talent of Lluis Barba, a Spanish artist represented by Atlanta-based Besharat Gallery, at the SCOPE art fair last week. 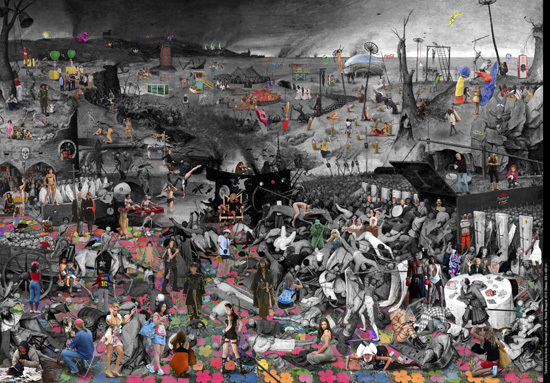 Barba uses the work of established masters, such as Hieronymus Bosch and Pieter Brueghel, as the backdrop for his landscapes, which he peoples with celebrities and no-names. Each are stamped with a barcode bearing his or her identity: Kate Moss has “KATE” beneath her barcode, Scarlett Johansson has “SCARLETT” beneath hers, and everyone else gets “TOURIST.” No surnames are needed for the celebrities, while the unknowns receive the apt “tourist.” The subjects appear to be visiting the scene and are caught doing what tourists do: snap photographs of what’s memorable, which, in this case, is famous people, though Barba populates his work with non-celebrities, too. Poor people, grubby children, nuns, and the like dot his scenes, but they don’t appear to be the subject of the tourists’ eye. It’s a situation replicated in the viewing of Barba’s work. Fairgoers stood before “El Triunfo De La Muerte,” Barba’s largest piece at SCOPE, and took turns IDing who was who. “There’s Johnny Depp,” said one. “Oh, that’s Paris Hilton,” said another. In the time I stood there eavesdropping, no one said, “Are they Photoshopped on a Breughel?” Maybe if I had been there for longer, I would’ve heard those words, but I believe I guess correctly (albeit cynically) when I say probably few fairgoers uttered that question. Not that I begrudge them their fun. Barba’s work is partly enticing because it’s game-like. Find the celebrity! it entreats. Knowing who’s who in pop culture testifies to the viewer’s knowledge of who or what is popular; not knowing demonstrates ignorance of the common cultural currency. Seriously, who, in this day and age, doesn’t know Lady Gaga? Professing otherwise suggests willful rejection of what the collective has deemed valuable and so can seem a snarky comment on the tastes of those who do, in fact, know who Lady Gaga is and can point to her in Barba’s work. Of course, choosing Breughel’s work as the landscape these stars and non-stars inhabit comments on tastemakers and tasters. Those who know Breughel’s identity occupy a rung on the ladder of taste or education (to be honest, they’re often the same ladder) different from those who do not, because to know who Breughel is sets you apart from the masses who more easily know a commodity like Kate Moss. In the words of blogger phenom Tavi Gevinson, “There’s a kind of teenage tendency to want to know about something other people don’t know about and to want to be cultured.” She was talking about the teen market when she said that, but I think the tendency encompasses all age groups. N+1 has received a lot of attention for making that same point, except their marketing spin frames the discussion of taste around the death of hipsters. Ah, death. So triumphant, batting a thousand in the game of life. The only pitch it has trouble with is fame, the manmade elixir that keeps us alive in the hearts and minds of strangers long after we’ve passed from this world. By choosing Breughel’s painting (which is, after all, called “The Triumph of Death”), Barba seems to comment on the few ways we might elude the Grim Reaper—being famous and preserving our visages in images that others might gaze on in the centuries ahead. The latter strategy slyly assumes that Barba’s work will last beyond its appearance at some art fair in New York, but given the artist’s past success—his works sold quickly at Art Basel in 2007, going for £25,000 a pop; Warhols at the same fair went for £4,000 that year—it seems a cautiously safe bet that we’ll be seeing more of the Spaniard.